Heroic Mode is a feature introduced in Update 1.1. It allows Trainers to redo the Normal Mode, fighting tougher battles and earning bigger rewards. It can be unlocked by beating Quest 68 (Eliza's Factory) in Normal Mode. Battles in Heroic Mode take 2 energy units. Beating Quest 116 rewards the Trainer with the Steampunk Dragon, beating Quest 205 rewards the Bighorn Dragon and the Heroic Adventurer Badge and beating Quest 295 rewards the Ribbon Dragon and the Heroic Conqueror Badge. Starting with the sixth island, wave battles will be occasionally encountered. In these battles, the Trainers must defeat two different sets of Dragons in order to win the quest. Starting with the ninth island, hiring Dragons is no longer permitted. Unlike in Normal Mode, mines are not available here. 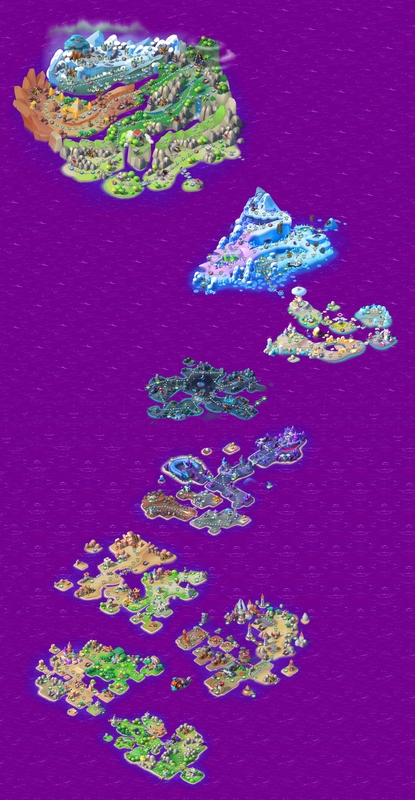 Main Quests travel along a path through each island and each quest must be completed in order to advance forward in the Heroic Mode of the Campaign Map. Rewards are set when the Side Quest(s) become(s) active again and they are 30% of the total rewards which one would get on their latest progress step in Heroic Mode. In other words, the further the Trainer is in Heroic Mode, the higher the rewards of the Side Quests will be. The rewards given and the Dragons encountered the very first time a Side Quest is fought, as well as their levels and skills, are the same for everyone. Starting with the first refresh, the opposing Dragons vary over time and are generated randomly while their levels get adjusted based on the levels of the Trainer's Dragons. The table below lists only the Dragons that are encountered the very first time in this mode. The rewards shown below are those given for beating the quest with 3 stars in one attempt. A Scroll will only be given once the quest is beaten with 3 stars, regardless of the number of attempts. Requirements marked with indicate the Side Quest is behind a gate, thus, even if the quest needed to unlock the Side Quest is beaten, the gate indicated in parentheses needs to be opened before the Side Quest can be attempted. Rusty Gates are places on the map that can be unlocked either with the help from friends, or by spending 5 Gems per slot. Certain Side Quests can only be accessed by opening these gates. There are 20 Rusty Gates in Heroic Mode. Each gate can be unlocked after beating the quest it is attached to. Once a gate is opened, it will remain open. This page was last edited on 5 December 2018, at 13:34.